Finding the best pancake holsters might seem difficult in today’s crowded market, but it’s not as hard as it seems if you know what to look for. 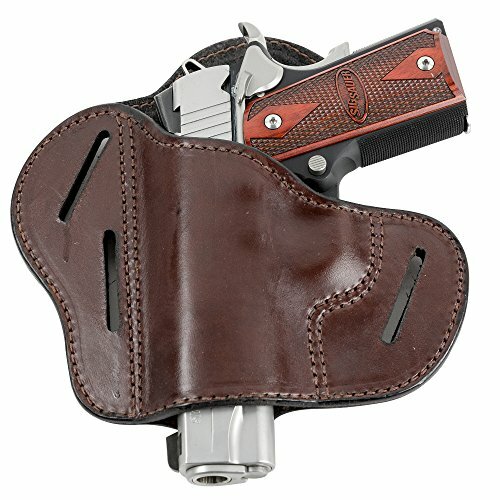 This type of holsters has been used for a long time, and people still use it because it’s a comfortable outside the waistband solution for both open and concealed carry. In the following article, we take a look at the top 10 pancake holsters currently available on the market and we examine the pros and cons of using each model. We start this list by reviewing one of the most popular pancake holsters available on the market. The Relentless Tactical holster is made out of genuine cowhide leather and it has a 3-slot pancake design that will allow you to carry your pistol just as you like it. Thanks to the holster’s versatility, you can wear it on your strong side, behind the hip, or in a cross-draw position. We were impressed by the holster’s carry capacity. This model is large enough to accommodate full-sized handguns, and you can fit most 1911-style pistols in it without any problems, no matter how long their barrel is. This is a good holster for the Glock 19, and it will fit other similarly-sized models. The only difference between holding a long-barreled and a short-barreled pistol is that the first one will ride lower than the second. High-Quality Construction – This holster is made out of genuine leather, and it has a high-quality construction. 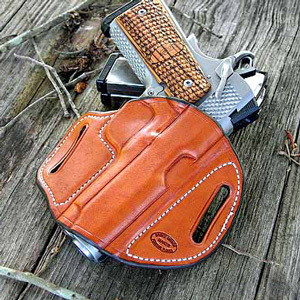 Snug Fit – The holster will fit your 1911 handgun snugly at first, but the leather will loosen up over time. The OutBags side carry pancake holster is made out of hand dyed full grain leather. The leather used for the holster’s construction has been cured and hardened, so it will maintain its custom shape no matter how often you use it. 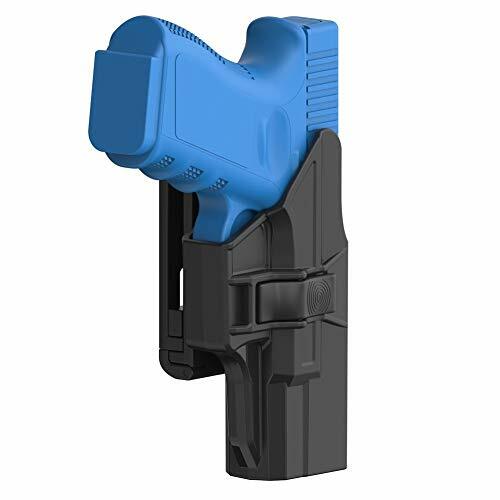 This holster was specially designed to hold compact and subcompact handguns, and it will fit a lot of different models. One of the things we appreciated about this model was that it’s easy to conceal. 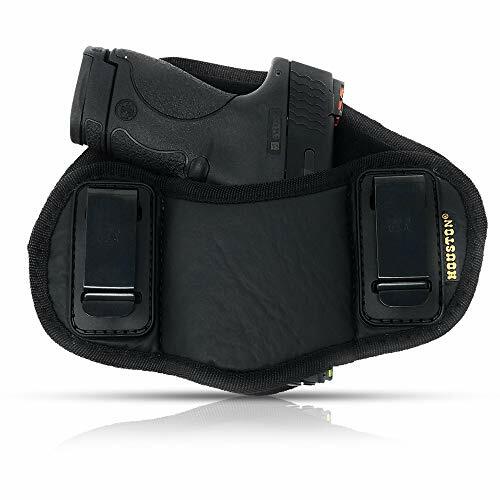 Thanks to its compact design, the holster is easy to hide underneath a shirt or a jacket when you side carry. Another good thing about this model is that it will fit your pistol nicely and it will keep it from moving. Comfortable – Thanks to its compact design, the holster will be comfortable to carry for a long time. The Barsony ambidextrous pancake holster is a good model that comes at a decent price. Unlike the pancake holster’s we reviewed so far, this model is made out of nylon, not leather. One of the advantages of using a nylon holster instead of a leather one is that it’s lighter. This will allow you to wear the holster for an entire day without feeling any discomfort. Nylon holsters are also more resilient to the elements. As far as this model’s carry capacity is concerned, the holster will fit most full-sized 9 mm and .45 pistols. 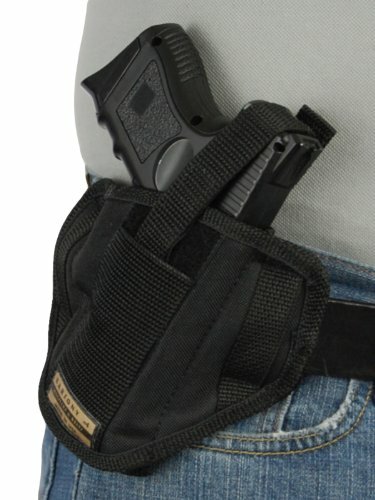 The holster’s loops are 1 ¾” wide, and they will fit on most CCW belts. Stiff Thumb Break – This model uses a thumb break to secure your pistol. Unfortunately, the thumb break is stiff and it will slow down your draw time. 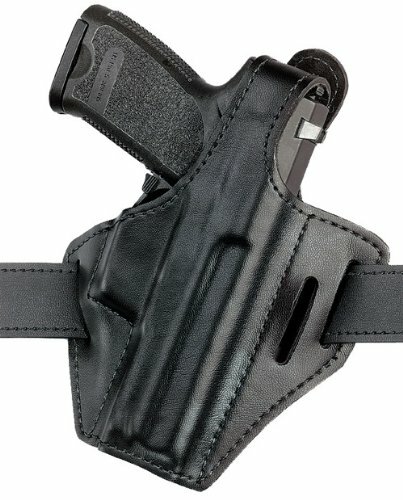 The TEGE holster is made out of a tough polymer that will withstand anything you put it through. This model is specially designed to fit the most popular Glock models and similarly-styled handguns. Unfortunately, the holster will not accommodate the Glock 19 Gen 5, but it will hold the Gen 4 comfortably. One of the things we liked about this model is that it comes with an auto-lock system that ensures your gun won’t move or wobble when it’s holstered. Drawing the gun is very comfortable, and you can press the release button using a single finger, which means you will also be able to draw your pistol quickly. Adjustable Paddle Cant – This holster comes with an adjustable paddle cant, so you can incline your pistol by up to 30 degrees. Difficult To Conceal – This holster can stand out underneath your clothes, so it’s difficult to conceal. Another public favorite, the Gould & Goodrich pancake holster has an amazing design that will make carrying your handgun a comfortable experience, even if you carry it for long periods of time. We were impressed by this holster’s construction. The leather has a great quality, but it’s not too thick, so it won’t be heavy. 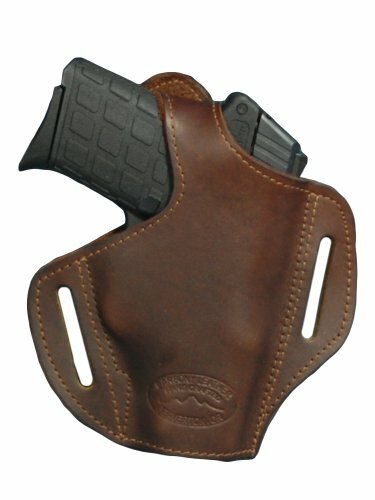 The stitching is nice and precise, and the holster comes with three slots, so you can either carry it with a forward cant or a high ride. The holster’s slots are wide, so it would be better if you would wear it with tactical pants instead of regular jeans or slacks. The holster will fit a lot of gun models, including the Glock 19 and similarly-sized units. Needs Time To Loosen – Even though the holster’s leather is not too thick, you will have to have patience with it to loosen up. Fits : All Glocks frames, Ruger P85, M&P40, XD etc. The Bulldog Cases pancake holster is a great budget choice for those who are looking for a leather holster but don’t want to break the bank to buy one. Despite its low price, this model is made out of high-quality leather that’s been tanned by hand. One of the things we liked about this model is that it has a generous design. This will make the holster wide enough to accommodate large frame autos, including all the auto Glocks, the M&P 40, and similarly-sized models. The holster comes with only two slots, so you won’t be able to change the pistol’s inclination. 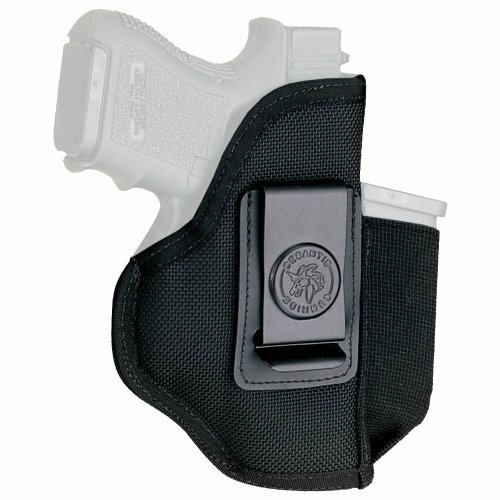 Thus, the holster is only suitable for those who like to carry their handguns in the high ride CCW position. The Barsony leather pancake holster is a small and slim model that will hold most compact handguns. 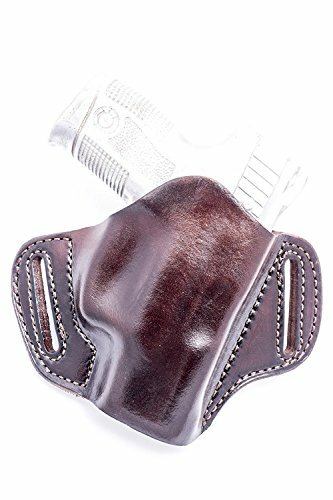 This holster is made out of genuine cowhide, and its slim design will keep the pistol close to your body, allowing you to conceal it with ease, even if you wear the holster during the warm season. We liked that this holster’s leather has a pleasant feel to it and that it will maintain its form after you shape it for your gun. The holster’s stitching has a high-quality, and it will help the holster keep your pistol secure as you move. The Safariland pancake holster is a good model that comes with three slots, allowing you to choose the cant position you’re most comfortable with. Depending on your preference, you can choose between the high rise and the forward cant CCW position. One of the things we liked about this model is that it will keep your pistol firmly in place. The holster comes with a thumb break that will keep your handgun from wobbling as you move. However, the thumb strap is easy to remove using a single finger, so you will still be able to draw the pistol quickly when you have to. The holster will fit the Glocks 17, 22, 31, and similarly-sized models. Narrow Slots – The holster should fit a 1 ¾ belt, but its slots might need some loosening up to do so. The Huston Gun Holders is a good pancake holster that comes at a decent price. This model is made out of ecological leather that’s nice to the touch and it has a suede interior that will protect your handgun from scratches. The eco leather is resilient to the elements and it’s even waterproof, so it should last for a long time. We liked that this model’s design allows you to choose between multiple CCW positions to carry your handgun. 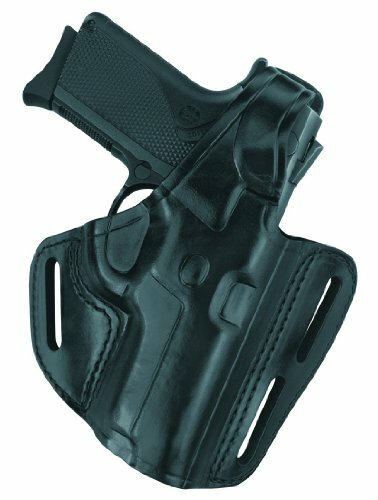 The holster can be used with good results both as an IWB and OWB model, and thanks to its slim design you will be able to conceal it with relative ease. This unit is large enough to accommodate most popular Glocks and other similarly-sized handguns. The DeSantis Pro Stealth is a small and comfortable pancake holster that comes at a decent price. This model is made out of black nylon and its back is padded for a more comfortable carry. The holster comes with a powder-coated spring that will fit any 1 ¾” leather or tactical belt. The clip can be removed and reinstalled on the other side of the holster, making this model suitable for an ambidextrous carry. Spare Mag – The holster can accommodate an extra magazine if you ever need one. 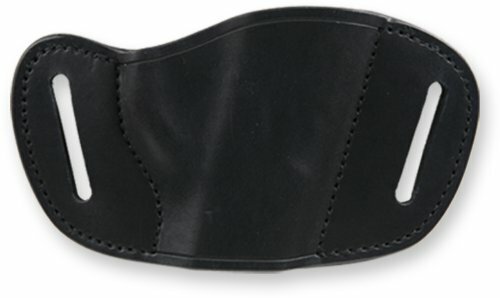 Thumb Strap Is Optional – This holster can be fitted with a thumb strap, but only if you pay extra for it. As you could see, finding the best pancake holsters is not really that difficult if you know what to look for as an alternative concealed carry holster. The first thing you should make sure of is that the holster is large enough to accommodate your handgun. Moreover, you should make sure the holster is not too large for your handgun, otherwise, you might be surprised to discover that your pistol wobbles as you move. Last but not least, you should make sure the holster can be worn as you like it to. Everyone has a favorite carry position, but not every holster can provide all of them.